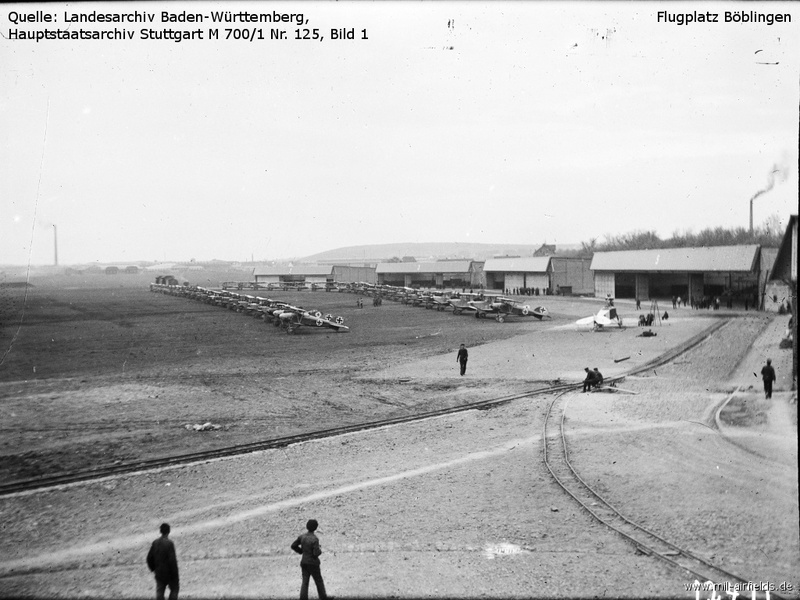 The Böblingen airfield was initially built in 1915 as a military airfield. 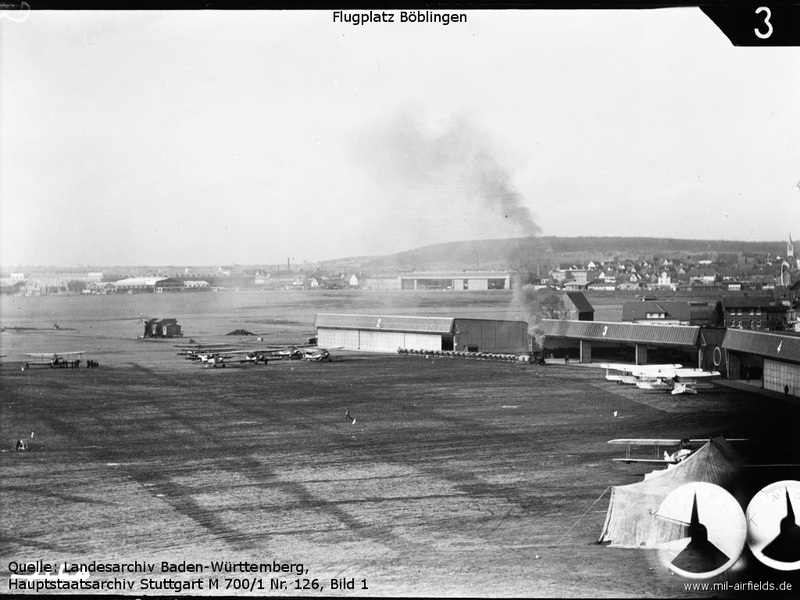 In the 1920s and 1930s, it served as the airport for Stuttgart, until this function was taken over by Stuttgart-Echterdingen. 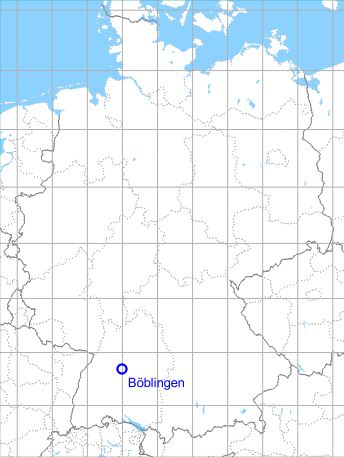 Then Böblingen was used by the Luftwaffe as an air base until 1945. 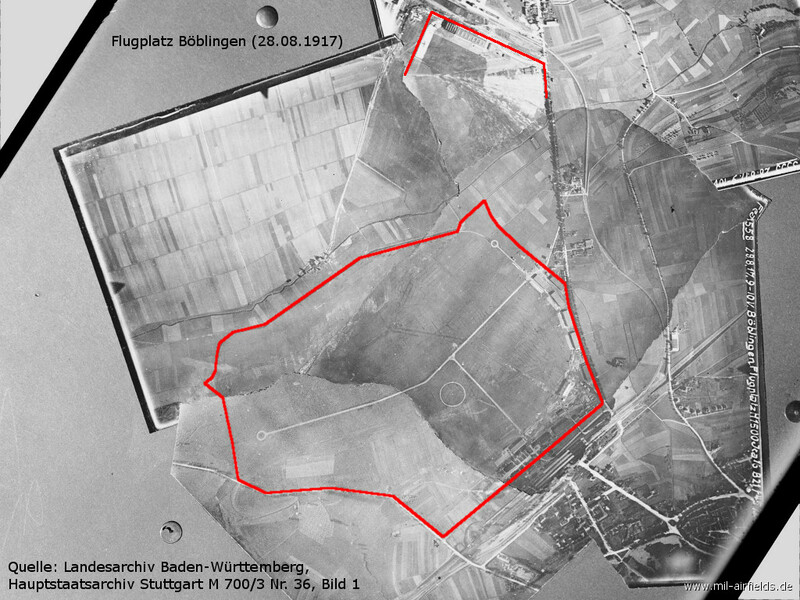 At the end of World War II, the field was occupied by US troops. 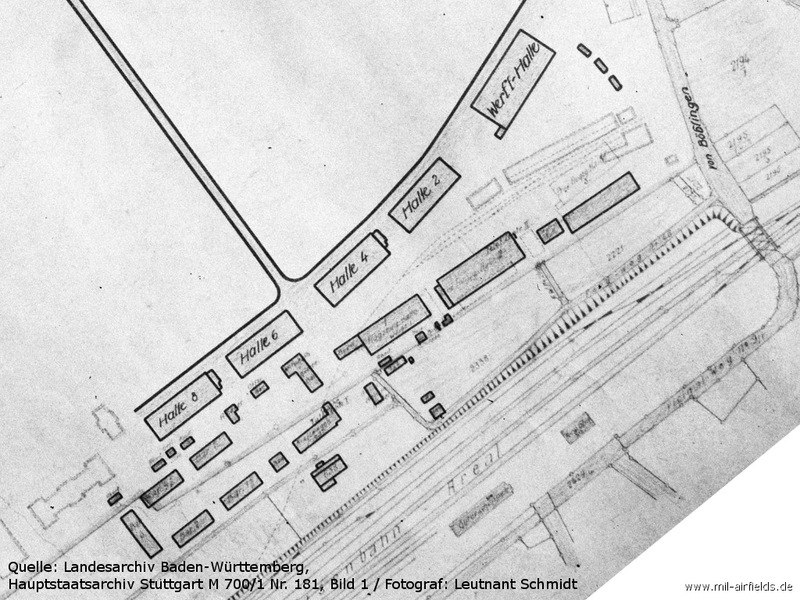 Later a maintenance facility for US trucks was set up. 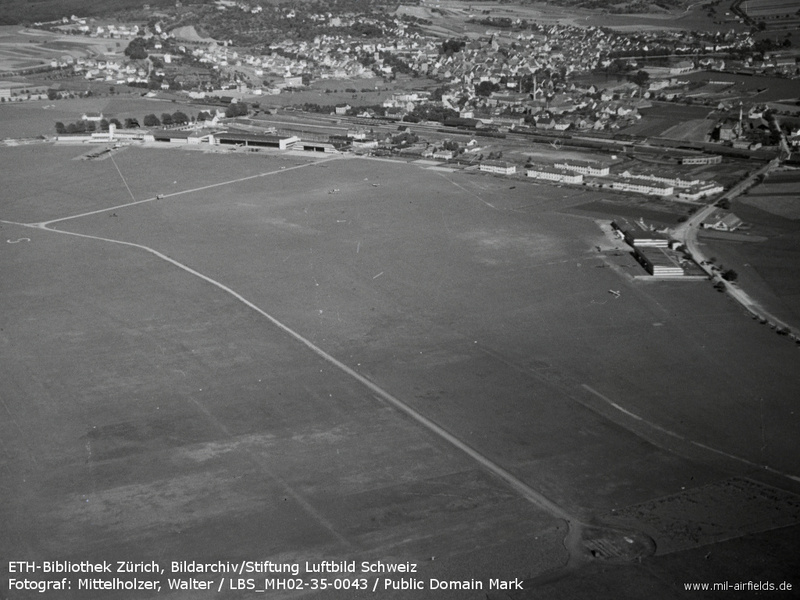 This facility also included a helicopter landing field. 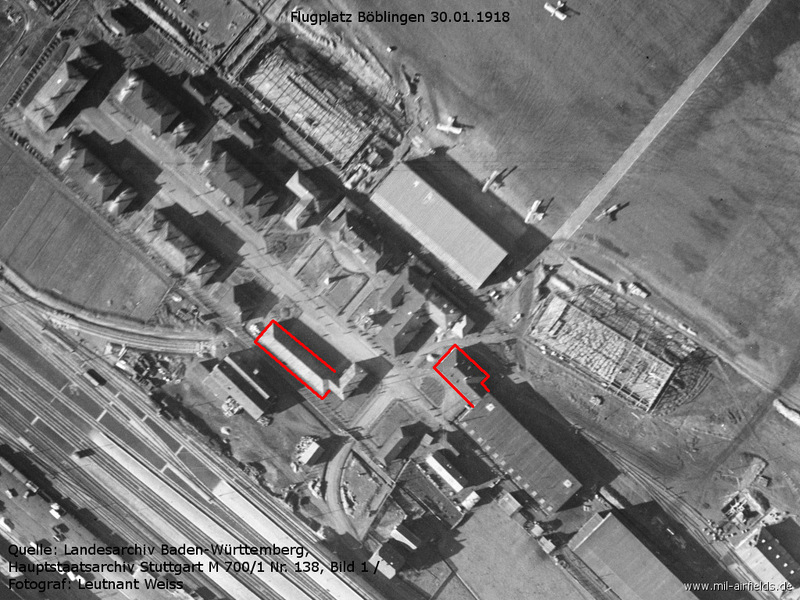 The barracks belonging to the former air base were taken over by the Bundeswehr. In the early 1990s, the US Army withdrew. 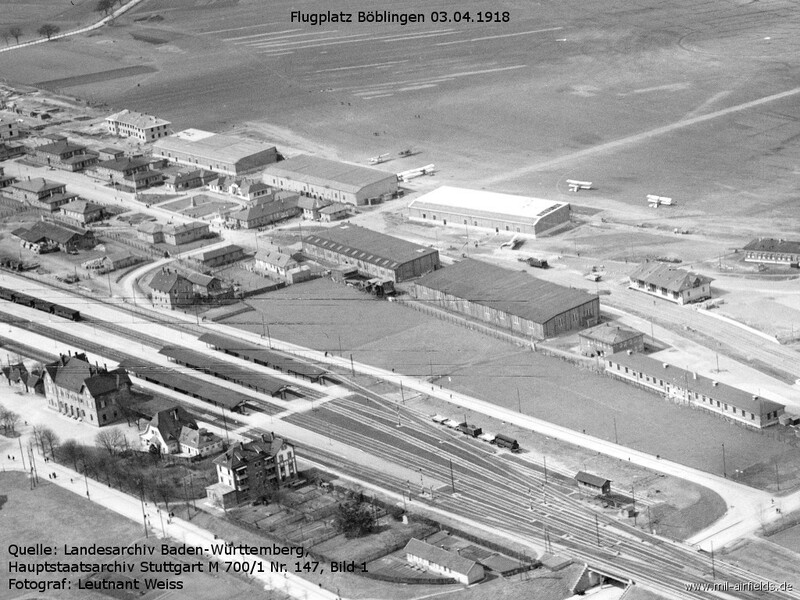 A few years later, the buildings of the old airport were renovated and the multi-purpose area "Flugfeld" was built on the site. 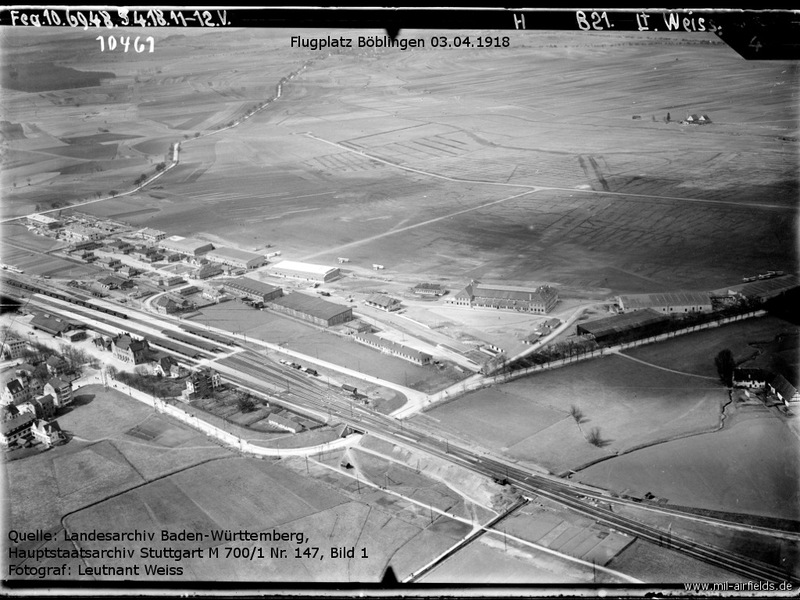 The Bundeswehr barracks were taken over by the police. 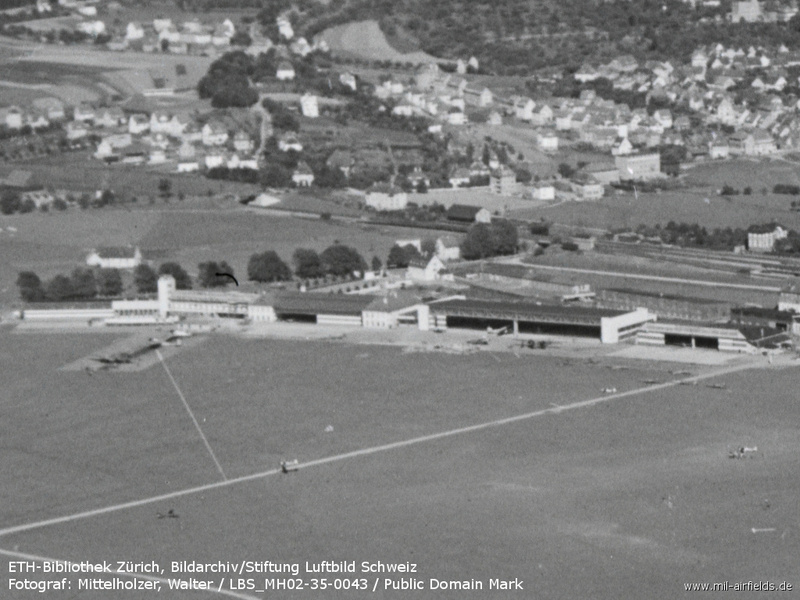 From the mid-1920s to the late 1930s, the field was used as "Stuttgart-Böblingen Regional Airport". 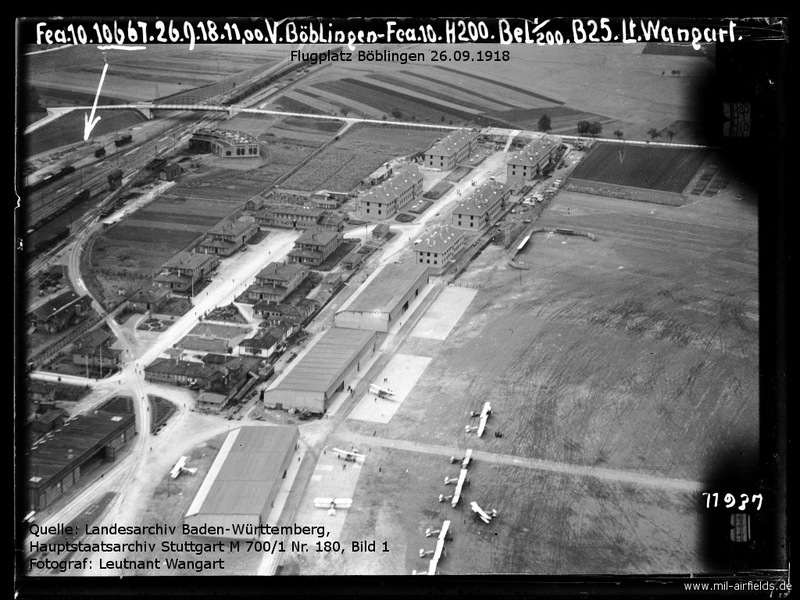 After the civil aviation moved to the newly built Echterdingen Airport, Böblingen was exclusively used as an air base until 1945. 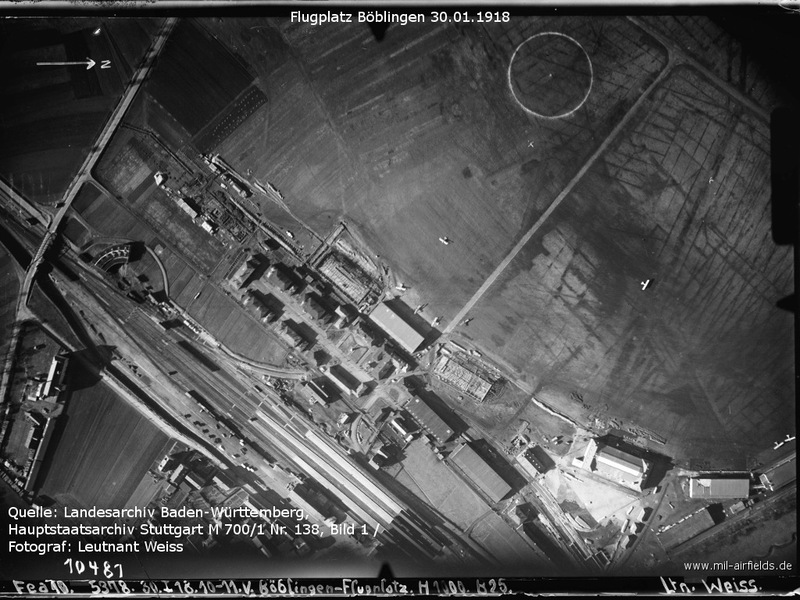 Aerial picture from 1934 - The displayed "S" can be seen on the left edge. 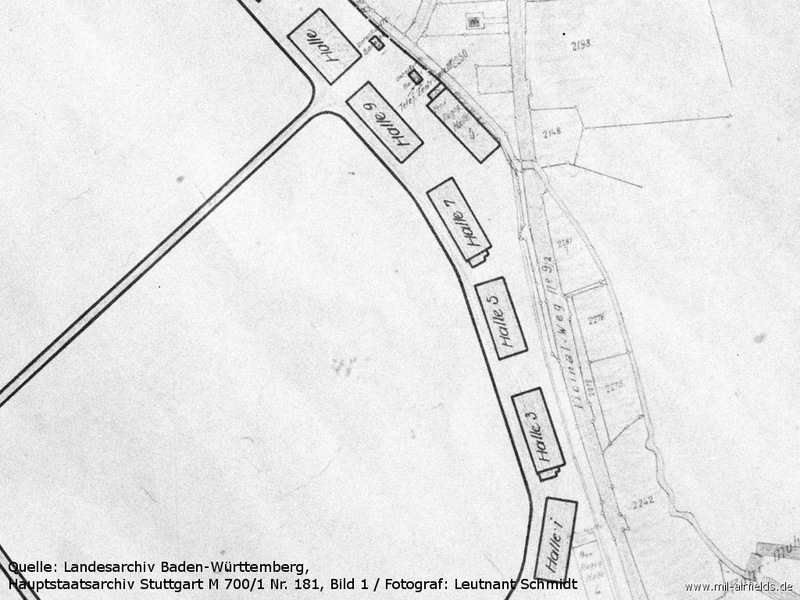 Good sod, shortest rolling distance 1000 m in direction southeast. 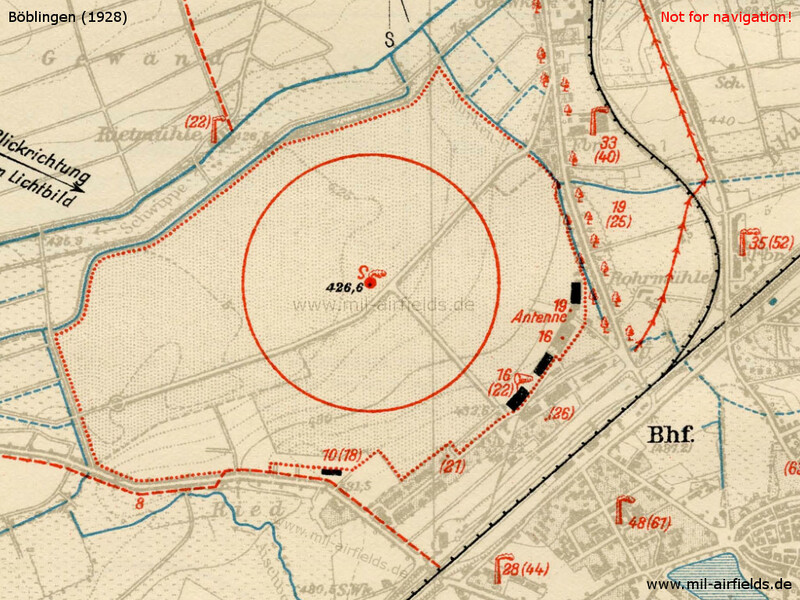 In the middle of the movement area smoke oven and "S" with ring of 8 cement segments spread evenly on a circle of 350 m radius from the center S. Landing sign is always displayed. Movement area boundary marked by red-white coated panels. Permanent night lighting not available. 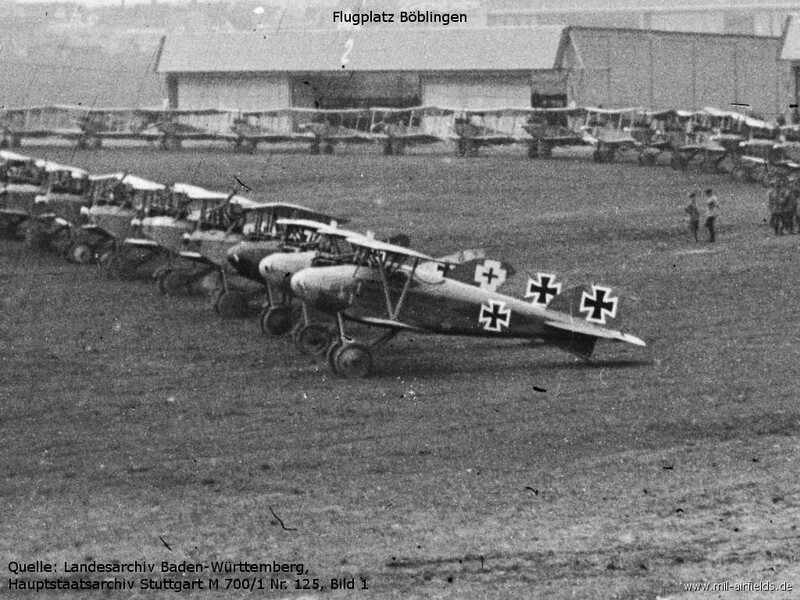 On request at aviation police station Böblingen, landing lights (torches). Land between two green to a red torch. Call sign "aet". 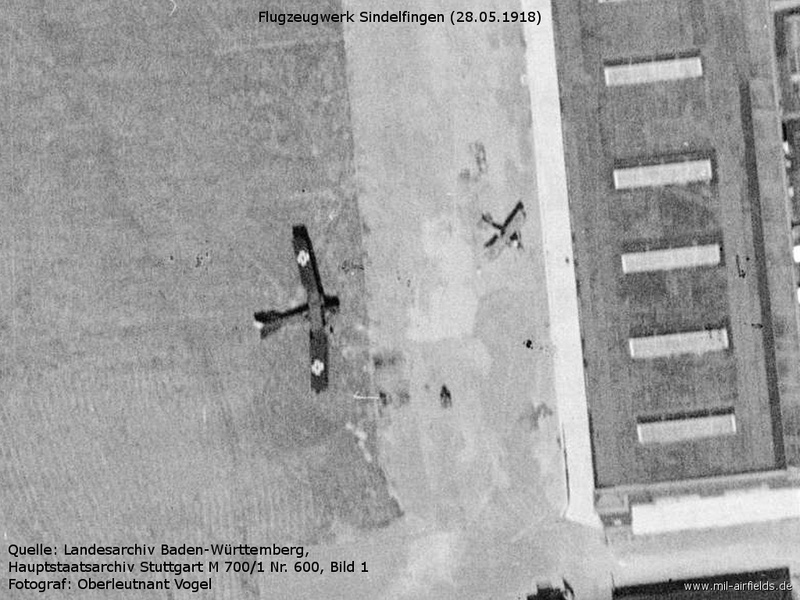 1 transmitter for radio communication with airplanes. 1 direction finder (under construction). 1 aircraft hangar 66 x 22 m.
The halls have lifting devices with a load capacity of 0.5 and 1.0 t.
Contain all machines and tools necessary to repair metal and wood aircraft. Electricity: 220 or 440 V three-phase current. 16 kW charging device. Spare parts for all aircraft and engine models of the Deutsche Luft Hansa in stock. For 78000 and 92000 liters of petrol and benzene. Mixers, taps and tankers available. Front and side ramp available. Medical room with healing assistant available. 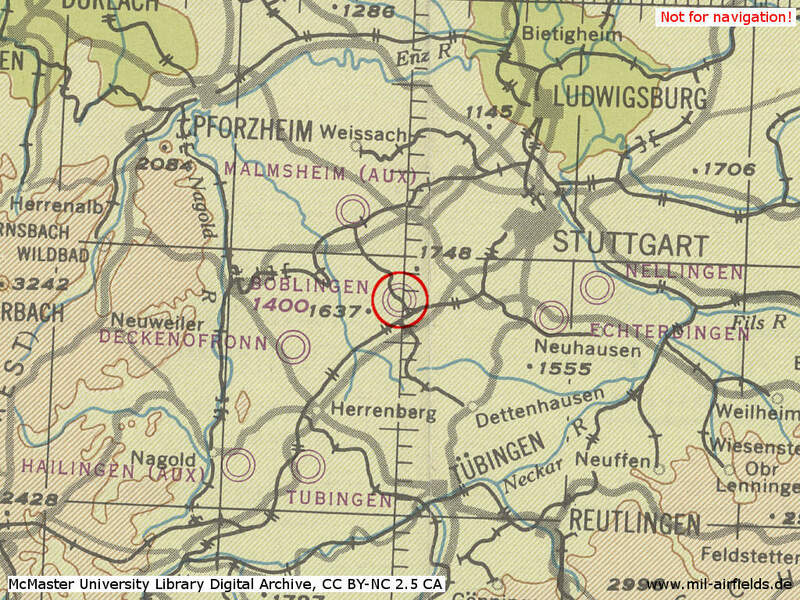 Nearest doctor in Böblingen (1/2 km distance). Customs office and postal service with telephone and telephone telegram transmission available. Passport inspection by police watch. Shuttle service at times of scheduled departures and landings. Taxi cabs can be ordered in the airport hotel. 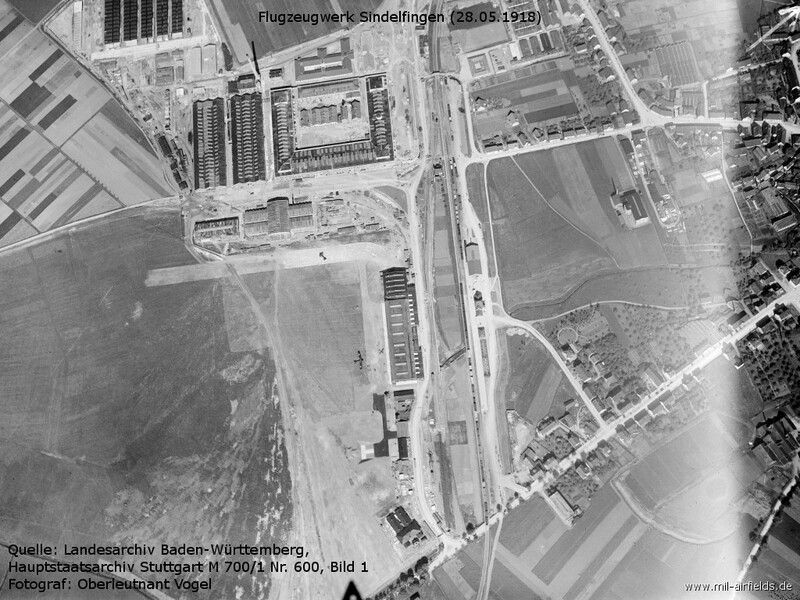 Weekdays, operated by Lufthansa with aircraft Junkers Ju 86 and by Swissair with Douglas DC-2. 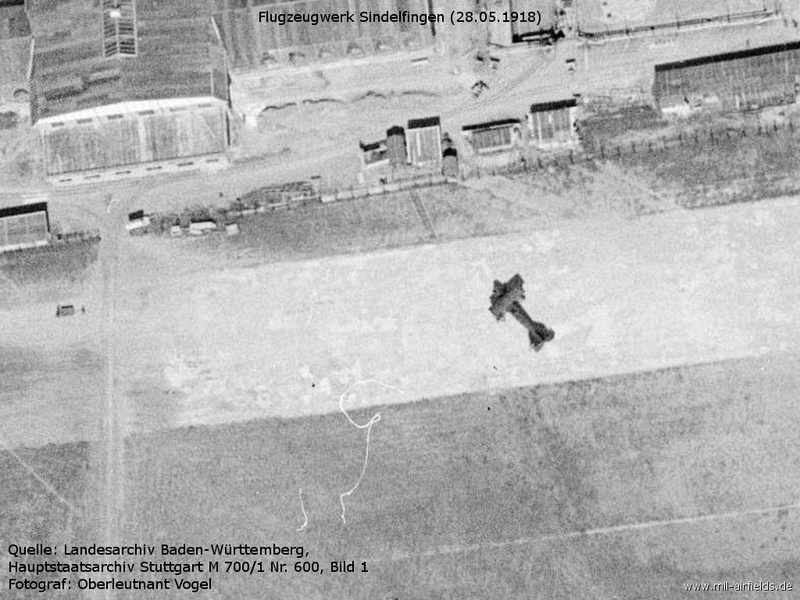 Weekdays, operated by Lufthansa with aircraft Junkers Ju 86. 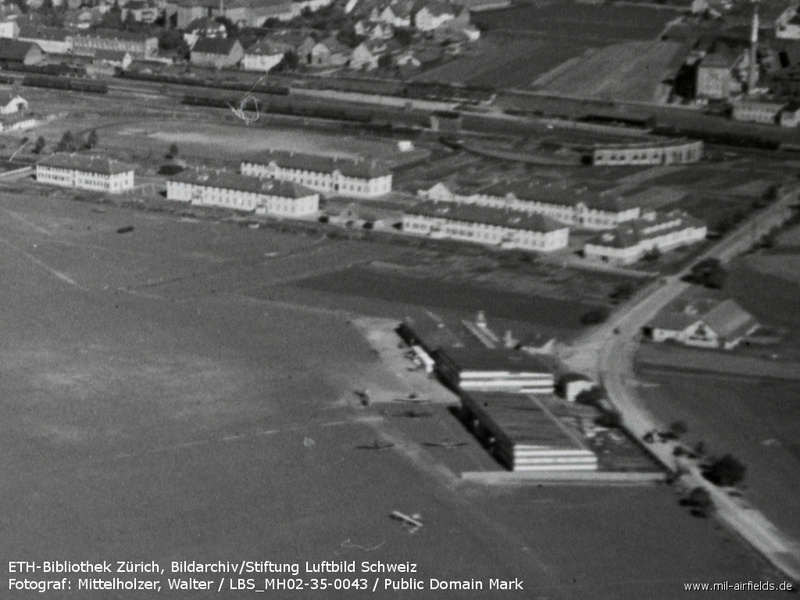 Weekdays and Sundays, operated by Lufthansa with aircraft Junkers Ju 52. 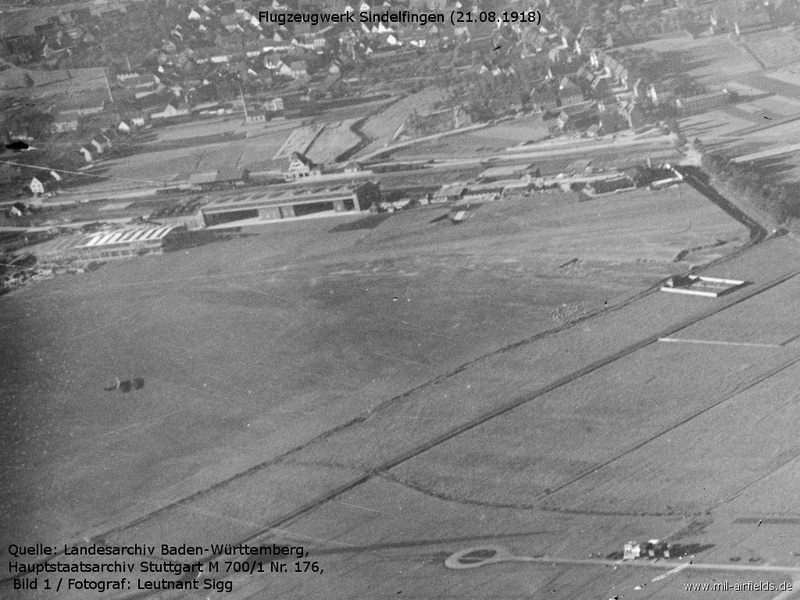 Weekdays, operated by Lufthansa with aircraft Junkers Ju 52. 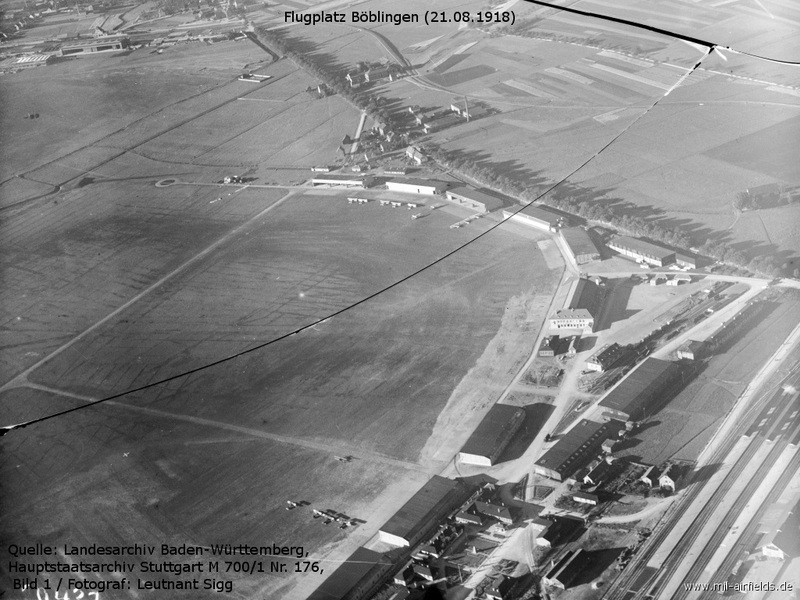 Weekdays, operated by Lufthansa with aircraft Junkers Ju 160. 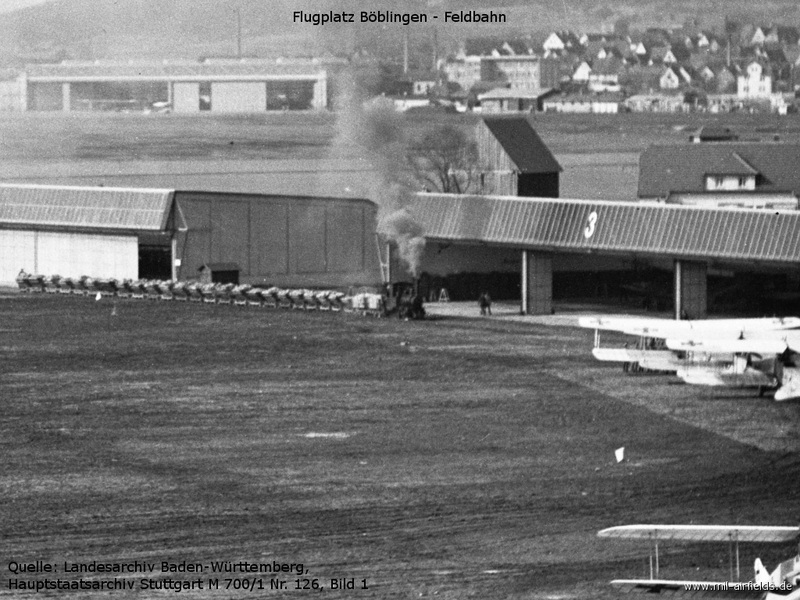 Mails and freight only, not Sundays to Mondays, operated by Lufthansa with aircraft Junkers Ju 52. 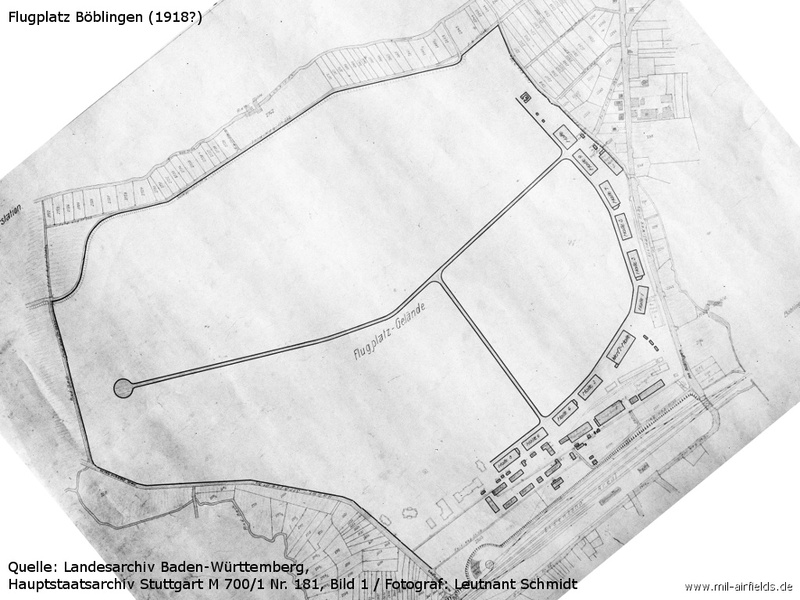 After the move of the passenger traffic to Echterdingen, the field was used by the Luftwaffe as an air base.